"In the future Dystopian society of Cabal, the government instills equality for all and offers its citizens the perfect system. There is food, shelter and jobs for everyone. The one requirement is to follow the rules without question, including the government's match in marriage and "The Day of the Chosen", a lottery that randomly selects families to conceive children as natural means hasn't existed in generations. Following her eighteenth birthday, Olivia Parker accepts her requirement to marry her childhood best friend, Joshua Warren, and is eager to start her work assignment and new life when it all comes abruptly to an end as she's arrested and thrown in prison. The only crime committed, her existence. Olivia is unlike the rest of the world born not from "The Day of the Chosen." The truth haunts the government and puts her life in grave danger as one simple fact would destroy the perfect system. A plague and it’s cure has wiped out civilizations' ability to naturally conceive children, and controlling governments keep their citizens under constant oppression as they dictate their day to day lives. Olivia Parker is the exception. After being forced to marry at eighteen, she looks towards her monotonous future of living in Genesis; lucky for her, she was forced to marry her best friend, Josh. A horrible series of events ensue as she finds out that not only was she born under abnormal circumstances, but that she may be the last woman with the ability to conceive. Trying to escape a life as a test subject, Olivia wanders with her best friend, Josh to find answers and a place to really call home. This book is quite unique and thrilling! Not just in subject matter, but in the constant upbeat pace that is set. There’s never a dull moment. This is great because I never knew what to expect next, and it kept me wanting to read more and more as each chapter passed, just to find out where Olivia will end up next, and what consequences she might face just for the mere fact that she was born. I love how the different governments are described in how they want to use Olivia in their rebellious war, and how Olivia learns more about herself and the different systems of society. Everything that glitters is not gold, and she and Josh find this out the hard way. Olivia’s determination in wanting control over her own body and life choices is admirable and she will go through any depths to get it. 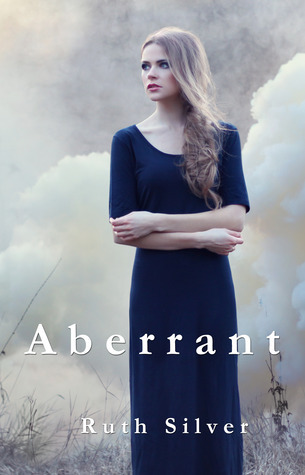 One of the first things I’d also have to say about Aberrant, is that I enjoyed Olivia and Josh’s relationship. There’s no instalove, or seedy out-of-nowhere love triangle that I find tiring in other dystopian novels. Their relationship has history, and I love how the author shows how they’ve grown to really love each other with their backgrounds. In their struggles they encounter horrible rules in which they are either forced together, or forced apart but through it all, their love survives and flourishes even in the upmost times of danger. The twist at the end really jumpstarted me to want to read more, so I’m pumped by the second book. With this story, you don’t really know what to expect next and that’s what I’m really looking forward to in the second book. In all, I really think this is a great unique dystopian novel that incorporates some elements of other well known books, with a twist at every corner. I’d definitely recommend this book if you love the Divergent, Delirium and Hunger Games series.